Photo by Joe Yekulis. 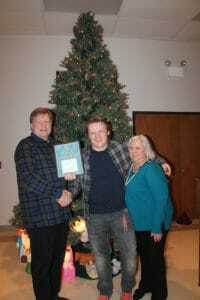 Jack Klovski was awarded Knight of the Year. On Saturday Dec. 1, Chelsea Knights of Columbus Council #3092 held its annual Grand Knight’s Christmas Party and Awards Night following participation in the Chelsea Christmas Parade in support of the St. Mary Parish “Away in the Manger” float. Grand Knight Ken Klovski handed out service awards to members celebrating membership anniversaries in 2018, and then gave out the highest awards for Knight of the Year and Family of the Year. Knight of the Year was awarded to his son, Jack Klovski for the many projects he participated in during the year and the amount of support he provided to the council. The Family of the Year Award was then given to the family of Eric and Julie Swager and their five children: Zebedee, Leo, Karl, Hoyt, and Marie. Not only are they actively involved in the parish, but whenever someone is needed to clean-up after an event from Lenten Fish Fries to parish breakfasts; the Swager family is always there to help. Photo by Joe Yekulis. 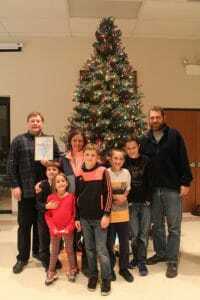 The Swager Family was named Knights of Columbus’ Family of the Year. The Knights of Columbus are a men’s Catholic family fraternal organization founded in 1882 for the purpose of serving people in need and their families.